I never really got into Amy Winehouse that much while she was alive and it wasn’t because I didn’t recognize her talent as a vocalist and songwriter. It was just that the aura surrounding her was already that of a tabloid train wreck by the time I caught on and I didn’t want to be party to the plan. I wasn’t exactly predicting that it would all end in tears, but it did give the appearance of being the latest variation on the all-too-familiar narrative of rock ‘n’ roll self-destruction. By 2011, Winehouse was dead of alcohol toxicity, joining the dreaded (and sometimes romanticized) “27 Club” along with Kurt Cobain, Jimi Hendrix, Janis Joplin, Jim Morrison and Brian Jones, to name just the most famous of those musicians who died at that age. Will this never end? Only a year after her death, film director Asif Kapadia was approached by her father (Mitchell Winehouse) and her record company (Universal Music UK) to make a legacy documentary of the North London-bred retro soul singer whose “Back to Black” won five Grammys and sold in the millions. 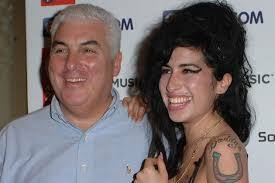 Kapadia was given use of Amy’s music and other materials but he was wary of being led into producing a “whitewash” film and asked for (and was granted) complete creative control. Kapadia went out and made a soul-searching film that looks way beyond the default image left behind of the soused, smoky-voiced singer with the beehive hairdo, tattoos and heavy mascara. 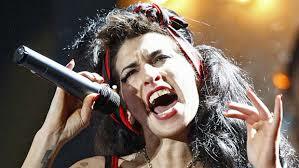 He was helped by the participation of two of Winehouse’s best girlfriends from her youth and esp. by Nick Shymansky, her first manager but also a teenage companion of hers: it’s Shymansky’s many camcorder clips that show a young and astute singer-songwriter with sharp influences (Sarah Vaughan, Tony Bennett) and an ebullient personality. But she was also a girl troubled by her parents’ divorce, diagnosed with depression by age 13 and, crucially, admitted to being bulimic. Little was done about it, especially after success beckoned. The soul-searching for this poor woman needed to arrive a lot sooner than this film. The problem of pop stars with too much fame too soon, combined with psychological issues, their own lack of impulse control and too many enablers crowding onto the gravy train is world famous. Where was the help? In an early video clip, Winehouse says “I don’t think I could handle it (fame), I’d go mad” and later sings “my destructive side has grown a mile wide.” Unsurprisingly, Mitchell Winehouse has disowned the film, specifically for saying of his daughter “She doesn’t need to go to rehab,” claiming the director cut out the last three words “at this time.” But it was precisely at that point (on the cusp of the big time, before she was stalked by a voracious media machine) that would have been the best chance for her. And bringing up her own refusal to go, in the famous “No, no, no” refrain of her mega-hit “Rehab” just doesn’t wash. All the song proves is her cleverness as a writer; it is a perfect balance between a brag and a cry for help (“I don’t ever wanna drink again/I just need a friend”). Winehouse’s popularity soon snowballed into obsessive fan and media attention, the kind of which less well-adjusted people have big problems with. Already a party girl, her substance abuse soared, especially after marrying the indefensible Blake Fielder, who had so thoughtfully introduced her to hard drugs. True, Amy was doing herself no favors but neither was there much selfless support. She is clearly heard in old recordings hoping for some guidance from her father. Even when she goes off to St. Lucia to get away from the cameras and the cocaine, her dad shows up with a TV crew, doing a reality show about HIMSELF. My new book, “Rock Docs: A Fifty-Year Cinematic Journey” will be released later this year. Soul-searching indeed. Quite a musical and evocative documentary, Rick. I wasn’t prepared for it and the film really got to me. So glad I screen this, but I doubt I’d rewatch it anytime soon. Fine post. Such a great read. I’m a big fan, I can’t wait to see this documentary. Excellent points all the way through, especially about the cry for help behind Rehab. Such a heartbreaking song and such a heartbreaking album. She was the real deal, both on and off cameras. We won’t get anything as good in the near future. Thanks, definitely a must see. It’s good to know that she got the honest documentary she deserved. Thanks! Please feel free to share the link. Enjoyed your take on “Amy” as well, esp. the point about how the filmmaker dwelled on images that may otherwise have seemed exploitative but was needed to drive home the point of the media feeding frenzy that engulfed her. Thank you, Rick! I appreciate it. The media’s impact on her downfall is undeniable, and the film definitely makes that clear.